The T-53 weighs almost three tons, is powered by a water-cooled, three-cylinder diesel engine and will likely cost around ¥40 million ($320,000) when it goes on sale to the appropriate authorities. A demonstration in Kita-kyushu city yesterday saw it run through its repertoire for a fire department there. Although a smaller revision of the previous T-52 model, the newcomer still performs the same tasks - crunching through cars, buildings and rubble to rescue people after disasters such as Monday’s Niigata earthquake. The operator-based control method makes the T-53 more of a cross between an exoskeleton and a truck than a true robot, but it’s a method that impresses in driving two powerful hydraulic arms. 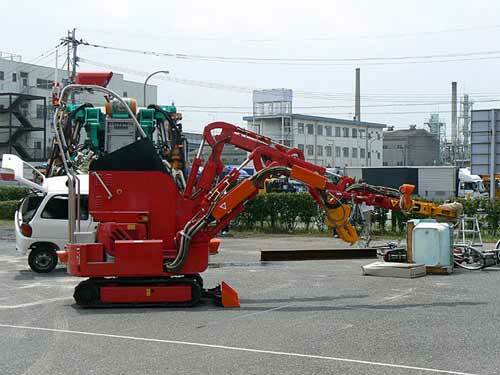 A specially licensed operator sits in a cabin just behind the machine’s arms and moves them by moving his own - the robot mirrors his gestures as they work together to move and pick up obstacles. As a safety measure, Enryu’s arms move a little slower than the operator’s - after all, it’s for rescues not flailing Transformers-style destructo-derbies. Given the machine’s operating time of up to six hours, it’s reassuring to know Tmsuk has safety in mind when it creates powerfully destructive mechanoids. Other technology aboard the T-53 includes several video cameras for maneuvering and observing disaster scenes from afar and Wi-Fi for those times when sending the beast in operator-free is the best option.